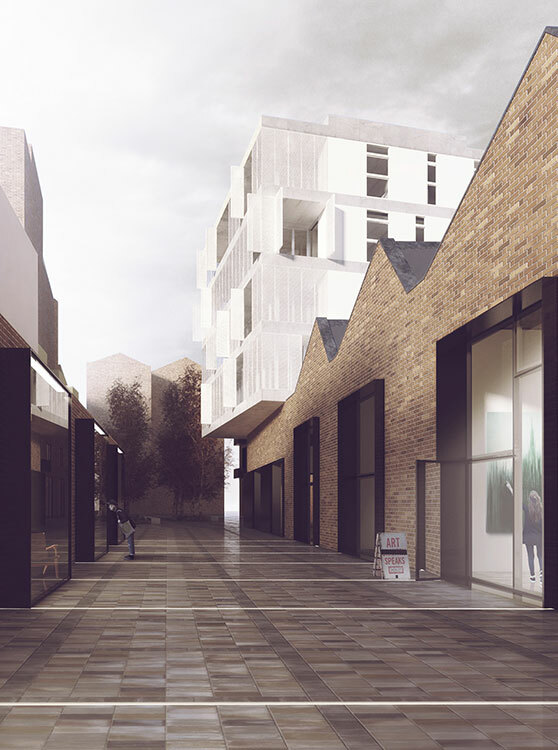 Part of a larger masterplan, our brief was to design approximately 70 new flats, arts studios and shop units totalling 9,500 m2 GIA on a site sandwiched between the rear gardens of a terraced street and a large industrial building. 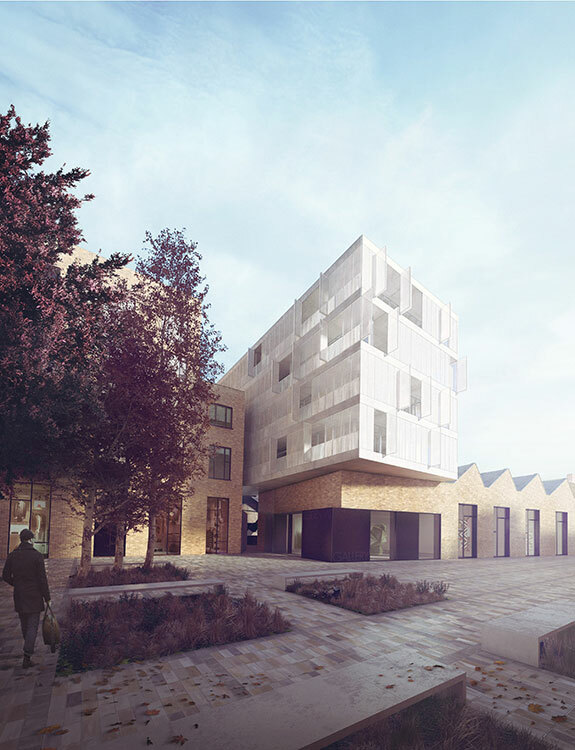 As the main entrance to the masterplan area, Plot 1 called for exemplary architectural design for a series of new and existing buildings. The new arts centre was to be tailored to its end-user. The residential units were a mix of one to three-bed flats and maisonettes. A central hub of circulation is accessed from the east, linking new and existing buildings. The route into the site is lined with display windows used by the gallery and artists, effectively signalling the site as a place for creative organisations and businesses. The artists’ studios are in a range of sizes, while a large double-height exhibition space contains the Tannery Arts Drawing Room gallery, with ancillary spaces off it. 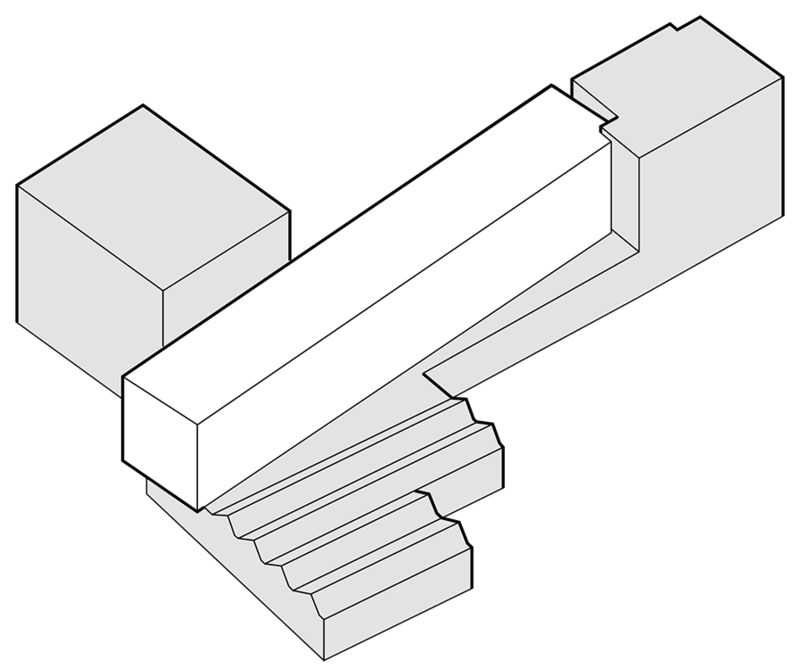 The sawtooth roof profile containing north lights over the exhibition and studio spaces make their function legible and echo the site’s industrial context. At the same time, they allow natural light to reach deep into the plan, which keeps the spaces attractive to a range of different kinds of occupier. 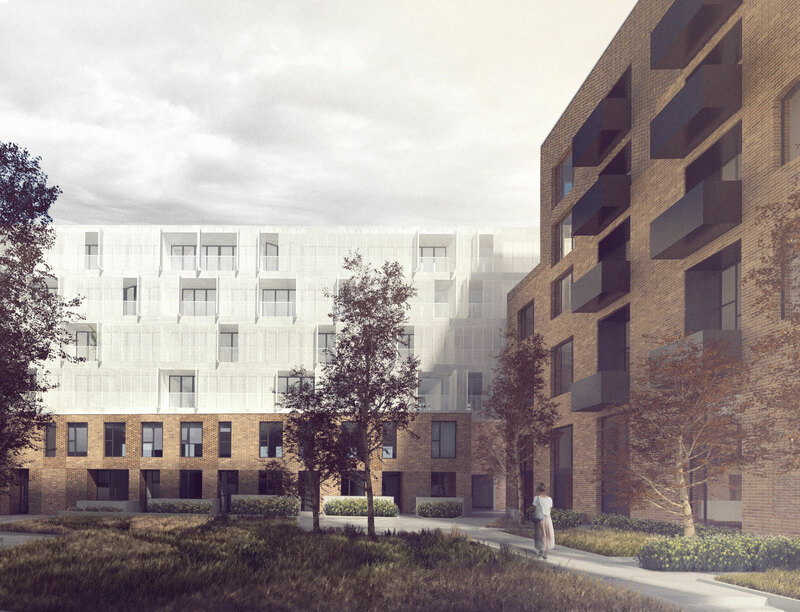 Our design for the residential mostly dual-aspect units anchors the building in its industrial context, balancing the human scale with the large scale industrial unit surroundings. Clad in folding mesh panels to prevent summer overheating, they are mostly accessed through a generous, dramatic shared entrance lobby. As a large, complex scheme planned for phased completion, the project requires close collaboration. BIM allows for efficient coordination across the consultant team. 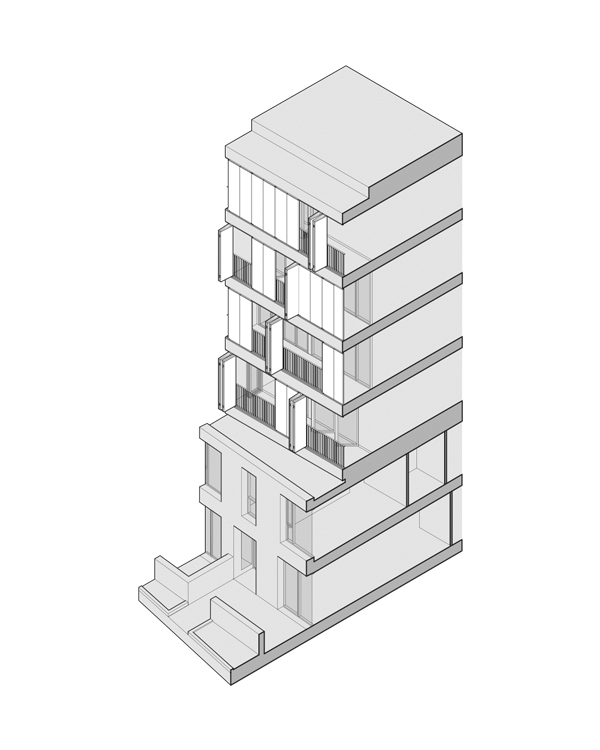 A light bar of residential units sits, spans and cantilevers over a new brick base that anchors the building in its context and creates a human scale to the surrounding street and courtyard urban scene. The route is given an active frontage by the exhibition and arts uses of the commercial space and display cases which line each side. This forms a welcoming new route and acts as a signifier of the creative uses in the development. The sawtooth roof profile over the exhibition and studio space make their function legible. The flats above mediate the scales of the terrace to Grange Road and the larger existing buildings in the site. The layering of shutters, balconies and glazing to these flats above create a translucent,shaded marker visible from Grange Road. The majority of the flats are accessed via a generously-scaled entrance lobby. The geometry of this space is derived from the grids of the commercial space fronting the new route and of the housing above. This space is a grand circulation space to be shared by the residents. The area to the north of this space would offer poor aspect and orientation for housing so this common use does not detract from the efficiency of the plan. Daylight comes in from the north and south, with open connection to external spaces. A dramatic stair links the basement through the lobby to the flats above. A large double-height exhibition space contains the Tannery Arts’ Drawing Room gallery. Ancillary spaces relating to the exhibition space are provided, in addition to artists’ studio spaces. These studios are in a range of sizes, including large double-height spaces. The route into the site is lined with display cases. These can be used as part of curated exhibitions, and also to display work of artists and designer-makers working within the development and local community. The shop front arts provide a sense of place and communicate the intention for the Rich Estate to be a place for creative organisations and businesses. The northern light glazing to the roof ensures natural light reaches deep into the plan, which means the spaces would be suitable for a range of occupiers. The building will typically be seen with a continually changing pattern of open and closed shutters. This enriches and enlivens the facade with signs of habitation. The translucency, depth, and balance of light and shade, contrasts with the solidity of the brick. The shutters add to the residents amenity by allowing them to control solar gain in summer, while allowing fresh air and controlled sunlight through their perforated structure.